92.5% of users rated this item at 4 stars or better. What's one thing a shooter can't have too many of? 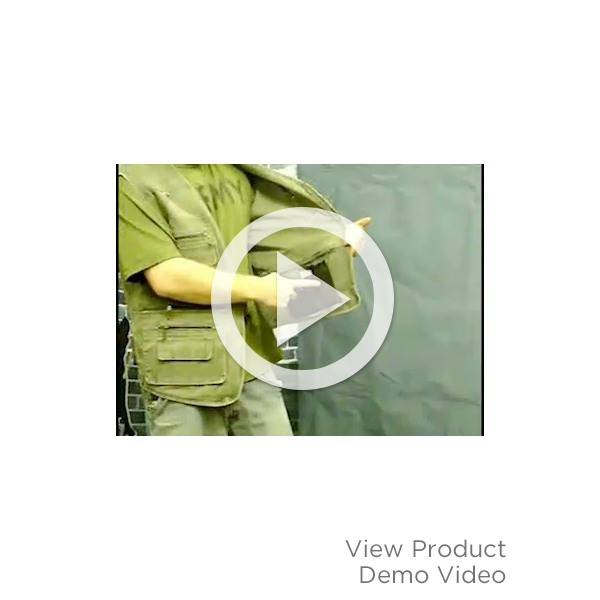 A tactical concealment vest, of course! Add our newest concealment vest to your wardrobe, and you'll get tons of features at an unbelievable price. Composed of a polyester-cotton blend, this sturdy vest is designed for carrying concealed. Two ambidextrous chest pockets can host a small to medium frame handgun. An elastic holster is sewn into each pocket -- no additional holster purchases are necessary. And the 1000 Denier pocket lining is strong enough to handle plenty of abuse. The interior is chock full of shooter-friendly features, including: six magazine/flashlight pouches, five cartridge loops and two zippered document pockets. It doesn't stop there -- the exterior is packed with six zippered pockets, four Velcro pockets, brass gear loops, YKK zipper pulls, and a pen pocket. The NRA woven label is added to the pocket. Whether you're shooting, travelling, or fishing, the NRA Reactor Vest has you covered. Colors: Olive, Black and Tan. All vests include sewn-on American Flag patch. Dry clean only. Imported. Item is discontinued and only available in sizes listed. Note: Sizes are non-standard. Please refer to sizing chart detailed in images above. Scroll through images to locate. Ordering from sizing chart according to your chest size will ensure adequate room to accommodate your gear. Reading what others said... I purchased a Large, thinking I would need it a bit larger, but found it to be too big for me... will have to give it away and get a medium. Other than the size issue, it is very nice... many pockets... almost too many as trying to remember where you put something you have to dig for it, but rather more than not enough. I read the reviews, and noticed some say they wished they had sized up 2x, I usually wear XL I'm 5'8 195lbs some what broad shoulders, kinda average build, I did and it is a little large, but I'm gonna make it work.. My suggestion is to measure your chest with arms to your side, if your gut sticks out farther than your chest your gonna have to account for that, mine don't and I should have sized up 1x and that way a hoody would make it perfect.. but still a nice vest, hides my M&P shield very good.. measure chest go by chart and size up 1x and it'll work..
Quality looks good. No issues with the zippers. I usually wear large shirts so I ordered an XL vest. It fits, but not as loose as I'd like. I should have ordered XXL. I was disappointed to see a "dry clean only" tag on the vest. A G19 fits in the vest pocket, barely. Bought one and have been wearing it daily for six months now. Generally very pleased with it. Couple of issues I do have is that after wearing it for a while, it gets heavier and heavier as I put more and more stuff into the various pockets. As all the pockets are on the front, the back of the collar pushes into the back of my neck which gets sore, especially when it is hot and sweaty out. If a bit of terrycloth or something with a little bit of cushioning could be added to the collar, and/or a pocket in the center of the lower back that a couple of pounds of counterweight or one of those water bladder things would be carried. Also, the hand warmer pockets get caught on the steering wheel as I get into the car and they rip free, leaving the pocket assembly attached only on the front and top. Not sure of a good solution as adding strength there will just move the rip to a different location. YYK Zipperrs all around. They all worked smoothly. Sounds like they listened to early buyers with problems. I wear 5XL shirts and they fit loosely. The 5X vest is almost a perfect fit for me. I won't be wearing it zipped, but it will zip - just barely. It definitely seems more like a 4X. The weight of the canvas seems to be a good compromise between weight and durability. It is soft with just a tad bit of stiffnes, which I am confident with go away with use. It was neatly folded and came out without any creases - a good thing since it is dry-clean only. The 5X vest is long enough to conceal an IWB/OWB holstered gun - 30 in. Appendiz carry might be possible if worn zipped, but it might be iffy. There is a D-ring on the back of the vest, centered and about 4-6 in below the top, for handing the vest of a nail/peg/etc. Even with a heavy pistol, the vest hangs evenly, at least for me. There are side cinches for tightening things up. The main pockets expand about 1 in, and the main breast pockets expand about 1/2 in. Although the main front pockets aren't weighted, it wouldn't be difficult to add them if IDPA is on the agenda. The pockets behind the mag pouches are gargantuan - 7-3/4" H x 13" L. The zipper opens 10-1/2'. The NRA logo is low key. Mag pouches are not very secure if you're active and carry single-stack mags. Just walking around, though, should be fine. The holsters aren't big enough for a 1911 nor an H&K VP9. Something the size of a Glock 19 might fit, but it would be close. If the elastic holster isn't used, however, a VP9 will fit in the holster pockets. It's a close enough fit that it won't move around very much. The pen pocket is just barely big enough for a large (1/2 in dia) pen. I have owned many vests over the years and this one is, by far, the most versatile. As someone who works gun and sportsmen's shows, I've found it has plenty of room to carry all the essentials with pockets to spare. I would recommend buying at least 1 size larger...I wear a 3x and find the 5x is the perfect fit for over a long sleeve shirt without binding the chest or arms. I previously ordered the Olive vest in 2011. This is a great vest that is well made. I have not had any problems with the zippers as some stated in previous reviews. The 2 concealment holsters with built in elastic strap are spacious and accommodating for my carry handguns. I also like the number of pockets on this vest and the inside magazine and speed loader holders. I just ordered and received the Black vest since I like this vest style so much. I truly love this vest, and all of the features ... that said, I must report that the zippers are all but worthless. I returned my first vest due to a broken zipper, and now the replacement had broken a zipper the very first time I wore it. They need to change this. I have both this vest and the 511 tactical vest also sold on this site and this is the better of the two vests. Better pockets for the gun (safety snap is a plus vs the Velcro of the 511 vest. and the pockets are arranged much more user friendly. yes one has to watch the sizing of both vests but just order bigger sizes. Except for one key thing, I love it! I normally wear 3xl, but in view of the warnings, I went all the way up to 5xl, and it STILL won't zip! The only reason I can think of for a company to ignore standards that much, in that direction, is to make customers feel like total slobs! That, and to justify charging more. Wonderful jacket - the concealed pockets look great! - but be VERY careful about the sizing (there is a comment saying that in the ordering process. I wear 2XL to 3XL shirts, I ordered a 3XL. I could not even zip it closed. Once I've got the return taken care of I will considered re-ordering it, probably the 5XL so if I have a handgun in the pocket it won't print.